Info-Tech evaluated ten competitors in the network perimeter UTM market and WatchGuard was rated very highly by this research group. 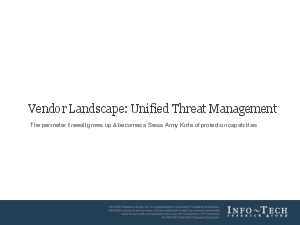 WatchGuard, with its balance of strong product and vendor capabilities at a market-leading price point, leads with a UTM solution that can deliver benefits to any organization. Learn how Watchguard compares with other UTM providers in the market.